Aerohive just released some exciting news about a new OEM agreement with Dell EMC. If you haven’t read the press release, I’d encourage you to do that. You may be asking yourself, what does this mean for me? Well, it really depends on your relationship with Aerohive. If you are an end user, it doesn’t have to mean anything. You can keep buying Aerohive products through your normal channel partner, and nothing has to change. With a valid support contract, you can continue to call Aerohive technical support for any questions you may have. In the future, you can also choose to buy directly through Dell EMC (or another channel partner) as well. It’s whatever works best for your organization! The key change in this relationship is for customers of Dell EMC, and channel partners who resell Dell EMC. The OEM agreement is going to greatly simplify the entire sales process (from quotes, ordering, delivery, and service). This is why I believe that customers will look to Dell EMC and to Aerohive to provide their networking solutions in the future. From the first call to inside sales, the ordering process, to delivery, to installation, for service, and (if needed) warranty exchanges, Dell EMC’s OEM agreement with Aerohive is a win-win. Customers of Dell EMC get best-in-class cloud-managed Wi-Fi with HiveManager NG, and all of the great 802.11ac access points from Aerohive. Aerohive gets to share the joy of its controller-less Wi-Fi (I’ve been a customer since 2012) with all of Dell EMC’s customers and channel partners. If you are a channel partner who resells Dell EMC products, this will make the entire solution process a lot smoother for you. 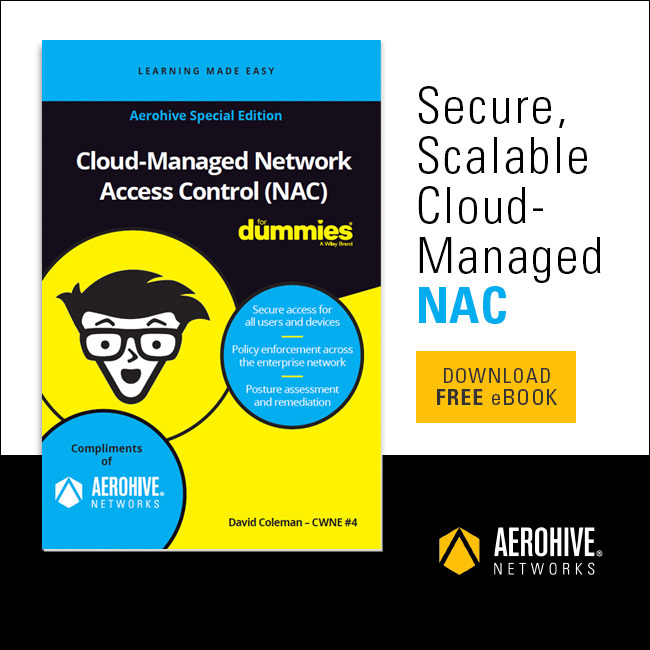 You’ll get access to Aerohive’s 802.11ac access points along with HiveManager NG. All of the pricing, distribution, and support will still be direct through Dell EMC. For Aerohive, getting to work with the tens of thousands of Dell EMC’s channel partners will truly increase Aerohive’s market reach world-wide. Dell Technologies is one of the largest IT vendors in the world, with sales into 180 countries and a combined worldwide revenue of over $74billion. Being selected as the OEM wireless solution by Dell EMC is a great validation of Aerohive’s technology innovations in Wi-Fi. As someone who has built a lot of my network around Aerohive products, I know that this will allow Aerohive to keep innovating with their best-in-class cloud-managed Wi-Fi products. I am a huge proponent of the “one window” rule with networking solutions. In years past, networking professionals bought networking gear. They’d piece together solutions to create their network. Now, we are buying into ecosystems that make our lives easier, create more stable networks, and ultimately drive our businesses forward. Aerohive and Dell EMC will make this a reality for even more customers. By combining Dell’s N Series switches with Aerohive’s 802.11ac APs in a single (powered by HiveManager NG) interface, customers can manage and monitor their wired and wireless interfaces from one window. Aerohive also recently announced Dell N1500, N2000 and N3000 switches now support switch stacking in HiveManager NG, and that Dell EMC N1100 series is now compatible with HiveManager NG as well. When I first saw HiveManager Online (pre-NG days), I was hooked on being able to manage my network from the cloud. A lot more customers are going to get to enjoy the breath of fresh air that is cloud-managed Aerohive Wi-Fi thanks to sales, distribution, and services from Dell EMC and its partners.